Sofreh kilims are a type of kilim with a unique twist weaving texture, representing one of many weaving specialties of the Kurdish tribes residing in Khorassan province in north east of Iran. 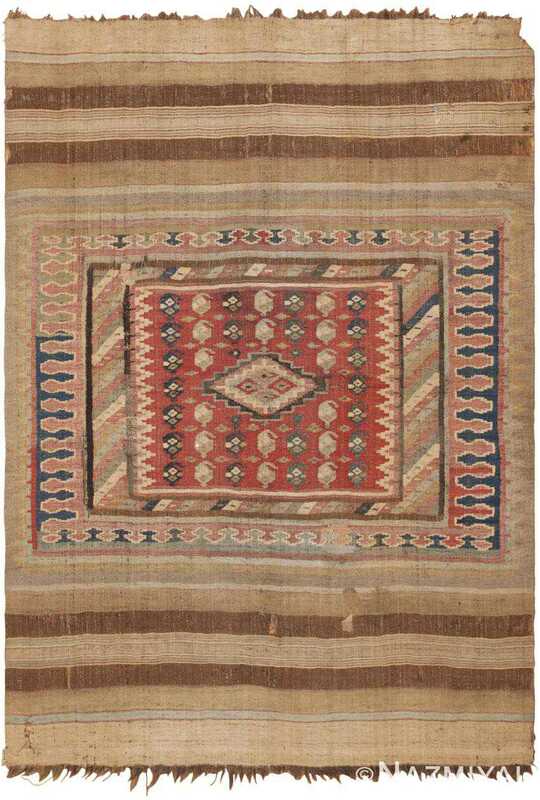 In the past, sofreh kilims used to be made by nomads to carry the bread and keep it dry from humidity and moisture due to the impermeability of the texture, giving the main reason they called tablecloth or “sofreh” in Persian language. Sofreh kilims are known for their warm colors and intricate geometric patterns and are mostly decorated with animal and human figures, indicative of immense respect for the nature derivative from the rich cultural heritage of the Kurdish tribes in the region. The weave of the sofreh kilims are quite fine and the material used in weaving these flat weave rugs is wool. Beautifully composed, this sophisticated antique Persian sofreh kilim showcases an ornate compartmental field bookended by a series of monochromatic stripes.